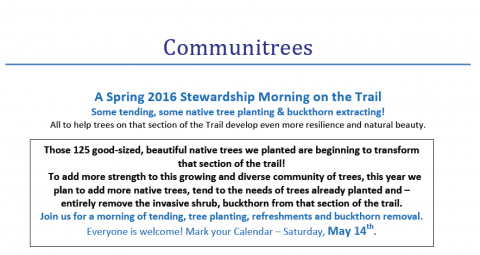 Some tending, some native tree planting & buckthorn extracting! All to help trees on that section of the Trail develop even more resilience and natural beauty. An opportunity to tend those 125 trees we planted on this section of the Trailway last year and plant about 15 new trees. All materials needed (water; mulch; stakes) will be there, ready for us to distribute to the trees. 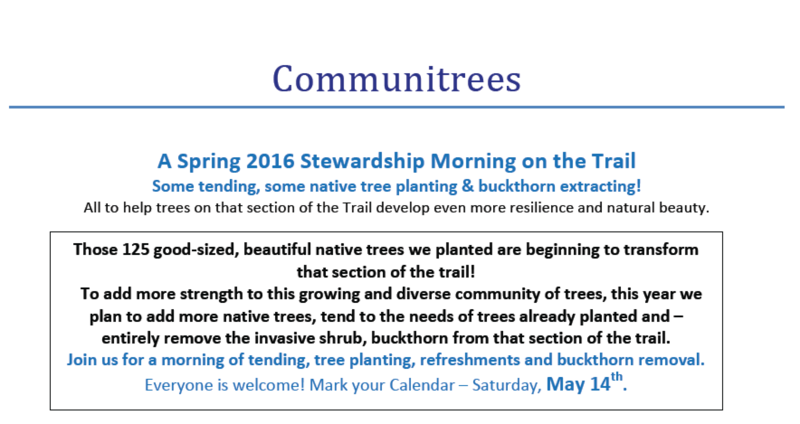 Please gather at 9:30 am on the Elora Cataract Trailway at 1st line east of Fergus (the extension of Anderson St.). We’ll each have a chance to introduce ourselves and learn specifics about the mornings plans! There’s parking at the Garafraxa lot by the Trail or just on the First Line. Also tea and great snacks served on the Trailway. A good chance to enjoy each other’s company as well as the beauty of this emerging, native restoration project. Kelsye Coulter, a local buckthorn expert and Serena Guenther of Baum Tree Care will show us how to correctly identify this invasive. Kelsye and Paul Hennekins are also generously lending us their personal Extractigator, so with ECTA’s ‘Extractigator’, we’ll have the use of 2 implements! Participants will have many opportunities to practice identifying the shrub, removing it and learning effective methods of eliminating it from our trails – and our own properties. Communitrees works in partnership with NeighbourWoods on the Grand to protect and support healthy growth of our local urban forest.